The Cliff House was remodeled just prior to the 1907 fire, so how do we know this is a photo of the newly constructed Cliff House? John Hall (2/26/2018): The stables to the north haven’t been built yet. If this was the remodel the south end of the stables would be in the picture. John Martini (2/26/2018): sometime after 1900 at least one of the arcade arches at the south end was glassed in (link), and stack extensions added to the chimneys west of the tower. 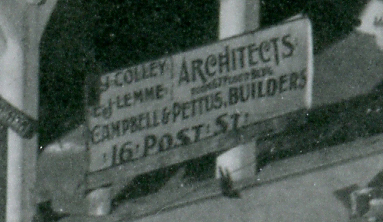 I always look for those tall chimneys when organizing historic photos of Ocean Beach and the CH. 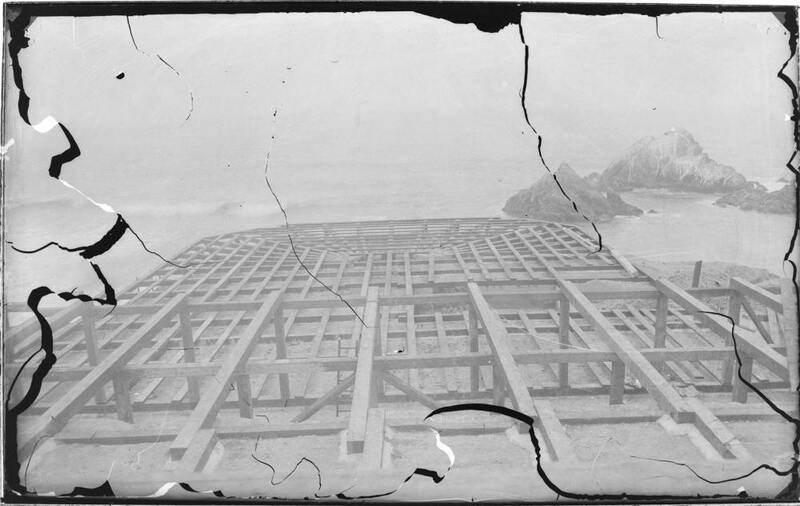 Visible for miles, they’re a handy reference for categorizing early vs later photos of the Cliff House. 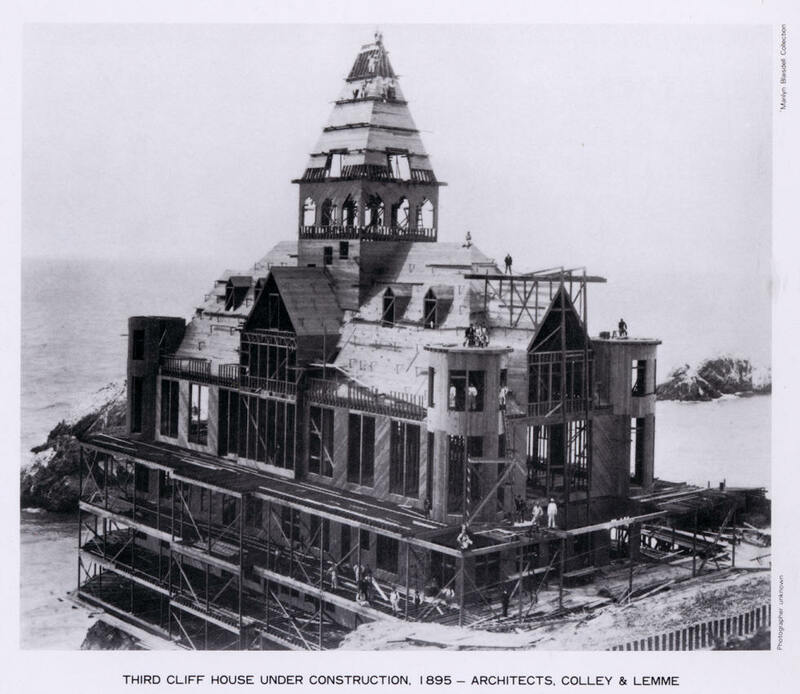 Emil S Lemme (1863 – 1921), partner of Colley in the construction of both the Sutro Bath and the Cliff House. In 1895 (?) 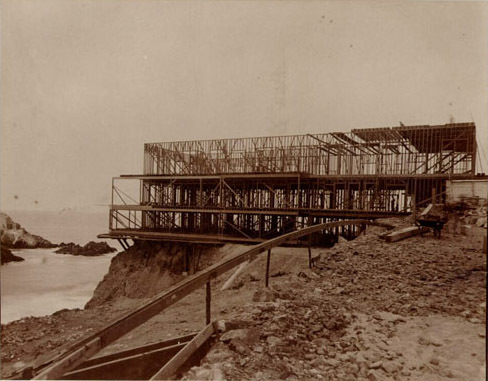 Sutro commissioned the architectural team of Charles J Colley and Emil S Lemme to design the new Cliff House; he had used them before, most notably on the Sutro Baths. 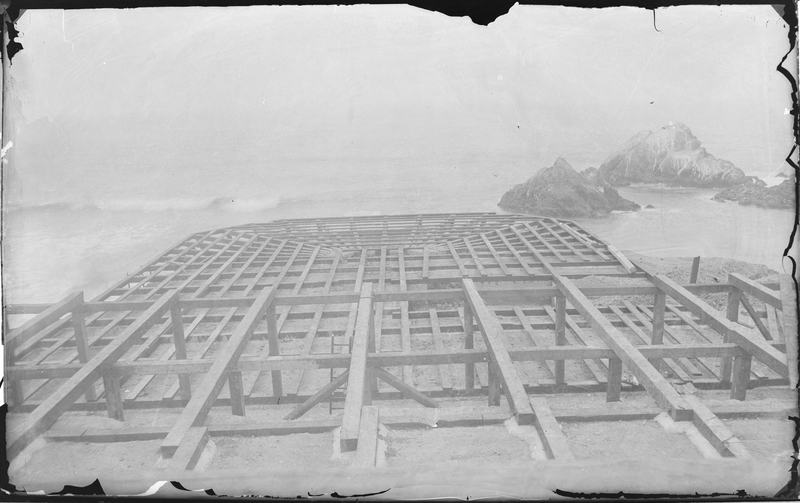 In early August 1891, Sutro had advertised in the San Francisco Chronicle inviting designs for his proposed bathing establishment. He offered a “premium” of $500 to the winning design and set a deadline for the end of the month. Sutro was likely an astute judge of a good design, being a successful self-educated engineer and inventor. His wealth came from the design and construction of the tunnels to drain the Comstock silver mines – a feat that many considered to be impossible. He was not afraid to go against the odds. Lemme went on to complete 150 or so working drawings. 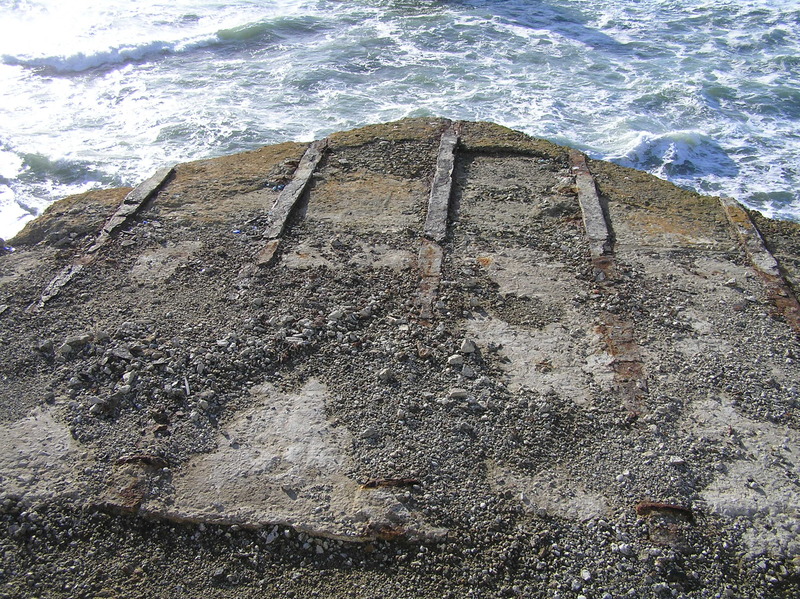 Colley acted as the project superintendent and was the main point of contact with Sutro. Prior to the Sutro Baths, the team of Colley and Lemme had won the competition for the Woodland City Hall & Fire station in Yolo County, California in 1890. Sutro was by far their most important client. Their partnership was relatively brief and appears to have been dissolved by 1895. Both Colley and Lemme came from the Midwest: Wisconsin and Iowa respectively: but had contrasting backgrounds. Colley had worked his way up through the trades. Lemme was a university-trained architect who had also studied structural engineering; a rare breed in those days. ...By July 1895 construction was rapidly progressing. Immense loads of earth had been removed from the site and some twenty or more massive iron rods had been secured in the rock face with cement as supports for the structure's foundation. According to the San Francisco Call of July 10, 1895, the main building would be five stories high surmounted with spires and a tower twenty-seven feet square which was to serve as an observatory. Tourists could rise the eight floors from the basement to the top, some 200 feet above the ocean, by an elevator. The main floor, level with the road, would contain a large dining room, parlor, bar, and numerous private dining rooms, with necessary kitchens. The second floor would have about twenty private lunch rooms, as well as a large art gallery to exhibit many of the gems from Sutro's private collection. 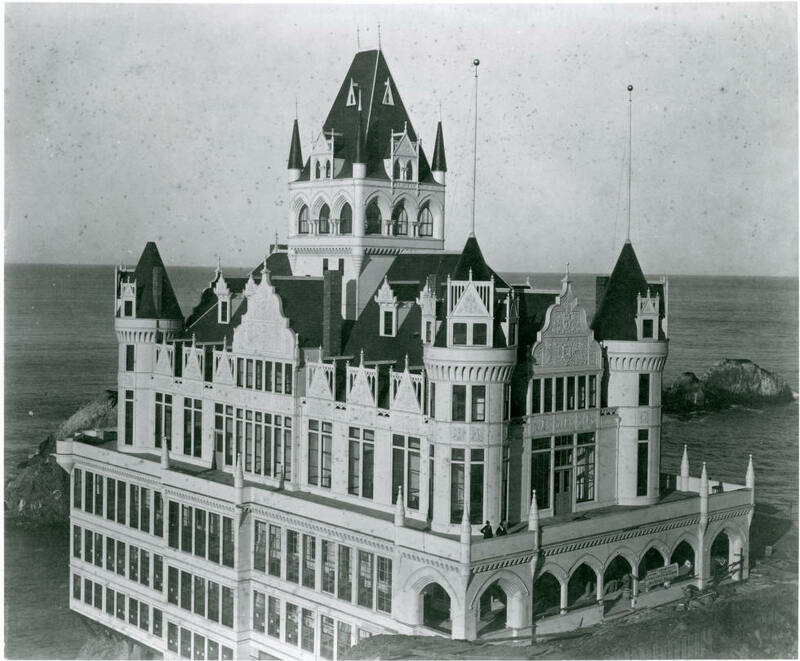 The third floor would provide a very complete photograph gallery, reception rooms, and parlors, with panoramic views of the shoreline from large circular windows. 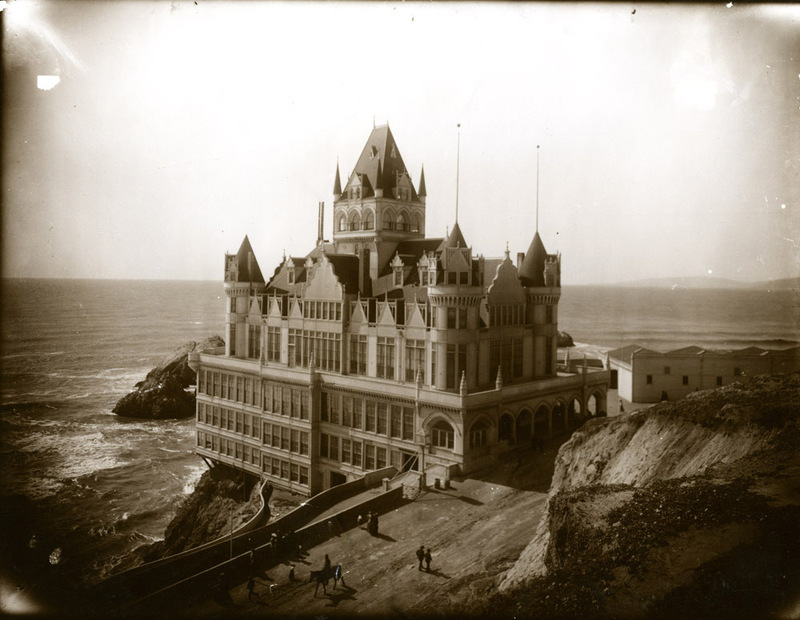 On the first floor below the road level, Sutro planned to reinstate a popular price concession area where tourists could lunch, buy shells from the curio man, and watch the seals, as was the custom in the old Cliff House. And in the basement the building's laundry, boilers, machinery, and rooms for employees would be installed. The furnishings for the rooms were going to be "elaborate and neat," and would provide the visitors with many settees and easy chairs in which to relax and enjoy the resort surroundings.